Picked as a team with Final Four potential before the season the Nevada Wolf Pack are someone that you might not have expected to see as a #7 seed but they’re what the Gators got and they now have the difficult task of preparing for what is one of the most unique rosters in the country often playing four 6’7” forwards at once without a prototypical point or shooting guard. Returning almost every piece from a Sweet Sixteen team last year and adding some of the most sought-after graduate transfers in the country the Wolf Pack are the oldest team in the country and with an average age of 22.8 within their starting lineup they are older than the starters from the NBA’s Phoenix Suns (average age of 21.8). 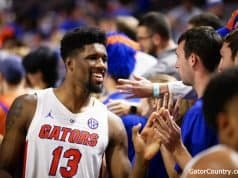 Dealing with a long, experienced, and talented group is going to be a challenge for the Gators but this game is winnable for them and I’m going to show you how. Here is my scouting report for the Nevada Wolf Pack. Nevada has a robust looking record of 29-4 but don’t be too scared by that number as their strength of schedule was not that high. They did play Arizona State, USC, and Utah in the non-conference but not anticipating how bad the Pac-12 would be those actually didn’t turn out to be very important from a resume standpoint and their league, the Mountain West, didn’t offer up many quality games either. Looking at their schedule on a whole they only played two, count it, two, quadrant-1 games and they split them (both against Utah State). That means Florida has won more quadrant-1 games (4) than Nevada has even played in so even though that Wolf Pack record is impressive, let’s just say there’s a reason they’re only a #7 seed. Their losses this year came to New Mexico, Utah State, and San Diego State with the Aztecs interestingly beating the Wolf Pack both at home and in the Mountain West Tournament. Nevada and Florida share no common opponents and that makes looking at how they play even more interesting as I dive into the film. Playing fast is at the core of coach Eric Musselman’s philosophy and they’ll take a look in transition whenever they’ve got an opportunity, 20% of their shots if we want to be exact. They are 62nd in the country in offensive pace and love to make the game a series of fast breaks both ways, a style that almost always favors them over their opponent. Caleb and Cody Martin (yes, the twins that also happened to play AAU basketball with Jalen Hudson), Jordan Caroline, and Jazz Johnson are all particularly skilled in transition and what makes this core special is the fact that they all have the handle to push the ball in transition themselves or trail the play and line up a catch and shoot jumper. That versatility off the rush is going to challenge Florida’s defensive communication and they will have to be focused in matching up with the Wolf Pack once things get going in the open floor. Stopping whoever has the ball has to be priority #1 as the Martin brothers and Caroline can really get to the hoop and finish and after whoever has the ball is stopped, the other Gators trailing need to find shooters. Nevada shoots 51.5% in transition versus 45.4% in the half court so any time Florida can slow them down and make them run offense it should be considered a win. I mentioned earlier how Nevada is one of the most unique teams in the country and one of the major reasons why is there size all around the perimeter. Caleb and Cody Martin (6’7”), Jordan Caroline (6’7”), and Tre’Shawn Thurman (6’8”) often play all the same time from positions 1-4 and when they do that they could cause the Gators some major matchup problems. Andrew Nembhard, KeVaughn Allen, Noah Locke, and Jalen Hudson are all going to find themselves guarding much bigger players at times and how they handle those individual matchups could make or break the game for Florida. Nevada does play a 5’10” guard named Jazz Johnson off the bench a lot of minutes but with the exception of him pretty much the entire Wolf Pack roster has plus size and that could cause havoc against a Gators team that is noticeably undersized. Okay, back to another thing that makes Nevada one of the most unique teams in college basketball—they isolate a ton, more than any other team I have seen this year. One-on-one basketball makes a lot of sense when you’re a team like Nevada with multiple long forwards that can all handle the ball like a point guard and they use an isolation-heavy offense that assumes you don’t have the size and defensive ability to match up with each one of the Wolf Pack’s perimeter thread. Usually they find whatever mismatch they think is most egregious every time down the floor and let that player go to work in an isolation setting. Will they do that against Florida? My guess would be absolutely. Pretty much every perimeter piece Florida has will be giving up tons of size to whoever they’ll be guarding and Cody Martin and Jordan Caroline are especially good at using their size and length to protect their ball on the way to the hoop. That makes it extremely difficult for smaller players to defend them and it’s that very fact that keeps Coach Musselman calling isolations over, and over, and over again. How Florida chooses to defend knowing how iso-heavy the Wolf Pack is will be really interesting as I think Mike White will know exactly what’s coming as opposed to some other teams that run more complex offenses aimed towards misdirection. The first option would be to stick to man defense and try to see how the Gator guards can hold up to these one-on-one battles. I think they’re going to have their hands full trying to keep the Martin twins and Jordan Caroline out of the paint but playing their normal man defense will allow for simpler defensive rotations that they have been making all season long, using their team speed to come with a help side defender while the other three players on the floor rotate to whoever is an immediate catch and shoot threat. 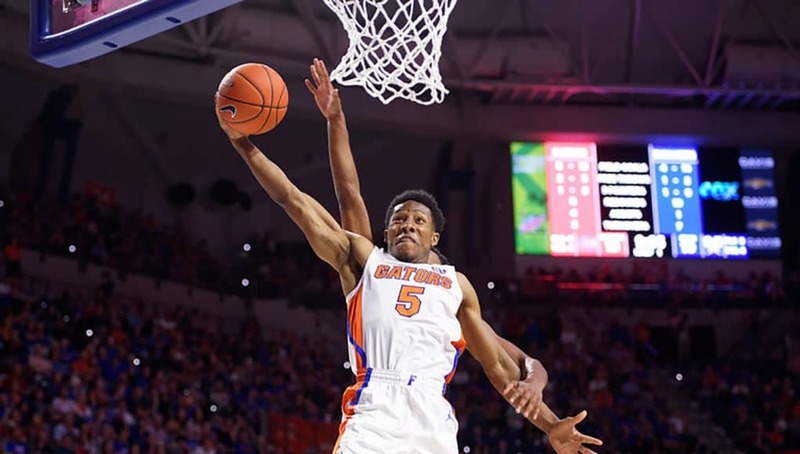 Mike White could also roll out his matchup zone that keeps the players he wants guarding isolations out of the perimeter which would keep Kevarrius Hayes close to the hoop for his shot blocking but that would also easily allow Nevada to choose which Gator they want to attack on the outside. In terms of one-on-one basketball they’ll also throw the ball down low and attack the mismatches their long roster is inevitably going to have against smaller teams. Trey Porter, Jordan Brown, Jordan Caroline, and Tre-Shawn Thurman are all comfortable scoring down low and the fact they have four interior threats in addition to their perimeter threats shows just how good they are offensively. Personally, I’d love to see a good deal of Florida’s 1-3-1 zone that falls back into a man defense. The initial zone look would slow down Nevada’s offense and allow nothing quick, and it might also force some late clock situations that don’t allow the Wolf Pack just to generate whatever switch they want and go to work down low. One potential issue with playing the 1-3-1 zone is the fact that Nevada is so tall and long and that height could allow them to easily see over the defense and pass through it. Nevada is a really good passing team that doesn’t turn the ball over much and they might be able to pass their way through any zone Florida rolls out. If Florida did choose to stick to a true zone defense that didn’t morph into man-to-man it would largely take away the isolation threat but here’s the thing, a lot of teams have thought to do that against Nevada and therefore the Wolf Pack has a lot of experience against it with over 35% of their possessions going against zone defense. They’ve even shot the ball slightly better against zone than man (46.1% against zone versus 45% versus man) so they aren’t going to be made uncomfortable by a zone. What’s interesting about their success against zones is that they are actually a pretty average 3-point shooting team overall and are much better at getting shots at the rim. How they’ve been able to generate shots at the hoop even against zone defenses has been impressive and Mike White’s number one job from a defensive scouting standpoint this week will be how to keep the Wolf Pack out of the lane. While Nevada is potent offensively the way you can beat them is definitely on the other end. By the metrics the Wolf Pack actually look good defensively (33rd) but when I watch them play I don’t see a great defensive team. Though the Martin brothers are slippery offensively they aren’t that athletic and can get beaten side to side by quicker players and teams that can generate off the dribble have given them issues. If nothing else, Nevada is a predictable defensive team as 99.1% of their possessions have been playing man defense so Coach White should know what’s coming. More accurately, Nevada plays a man defense that is switch-heavy and almost has pack line principals that values protecting the paint over preventing jump shots. It’s a conservative defensive scheme that really utilizes their length and the switching they do could make for a bit of a schematic challenge for Coach White. By switching everything Nevada renders a lot of their opponent’s offensive sets useless but Florida’s Princeton offense could allow for some potential miscommunications that could lead to layups. Nevada’s dedication to protecting the paint also means they’re going to let Florida shoot some threes. Their length gives them an ability to get out to contest shots on the perimeter despite setting up closer to the rim so it’s not like the Gators are going to get a bunch of wide open threes but they will get some good lucks at decent ones given that’s what Nevada is willing to give up. 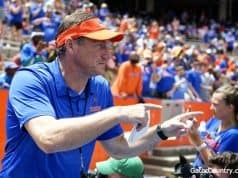 Whether or not Florida can stress the defense by drilling some threes early will really dictate the way Nevada chooses to defend the rest of the way and if shots for the Gators can fall it will force the Wolf Pack to take another step outside that could open up more driving and passing lanes. When 5’10” Jazz Johnson is on the floor the Gators could have some success playing out of the pick and roll with Andrew Nembhard as his length should allow him to make some passes over Johnson. The conservative defense of Nevada probably won’t allow too many looks inside to the roll man but if they have to react and tag the big man Nembhard could find a shooter. This a game where Florida needs their senior guards Jalen Hudson and KeVaughn Allen to step up. With quickness advantages over their opposition in Nevada they’ll have to be able to make plays off the bounce without turning the ball over a ton like they did at the SEC Tournament. Defensively they’ll both be challenged to guard individually and whether or not they can compete on that side could decide whether Florida’s season continues or ends in Des Moines. Nevada wants to play fast and Florida has done a great job all year of slowing down teams looking to make the game a track meet both ways and if the game is low possession it heavily favors the Gators. In the half court Florida could struggle guarding the constant isolations from Nevada but I also think they have a better chance slowing down bigger forwards in isolation than they did with the smaller, quicker guards they struggled with in isolation like the ones Auburn and Mississippi State had this season. 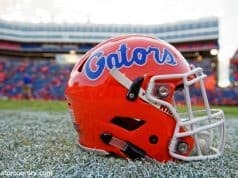 From an offensive standpoint I really think the Gators can score against the Wolf Pack. Nevada’s conservative defensive scheme will allow the Gators to have plenty of scoring opportunities and they have had much more success against passive defenses like Nevada’s as opposed to the higher-pressure defenses that have given them a lot more trouble. This game is likely going to be tight as you’d expect from a #7-#10 game in the Tournament but I think the Gators have a solid chance at advancing.